Need a reason? Here are our top ten ... These might just convince you studying abroad is the best thing you can do while in college. You can study a language from junior high to college graduation and never gain fluency. If you don't talk with native speakers, if you don't suffer through the awkward language-barrier situations that fill the study abroad experience, you're never going to be truly fluent. That said, you can also spend a whole year abroad chatting only with other English-speakers. If you're not uncomfortable, you're doing it wrong. 2. Be a better job candidate. Ah, globalization. Governments find it increasingly difficult to ignore challenges a world away. Transnational corporations chase markets across the planet. The Internet slowly dissolves the boundaries on maps. Even the small start-up in your hometown prefers bilingual employees. If you want to stand out in today's job market — heck, if you just want to be relevant — an international perspective is critical. 3. Create a lifelong love affair with another country. Study abroad is not a short-term experience. It will shape you for the rest of your life. You'll know this country intimately, learn to speak its language and gain an appreciation for its people. Back home, you'll look for films from there, for restaurants that serve its dishes, for books by its authors. You'll perk up when it's mentioned on the news or when you hear a snippet of its language on the street. You'll have lived in it, and it will continue to live in you. 4. Gain a new appreciation for your home country. Even the most open-minded study abroad students will be unable to avoid comparing their host country with their home country. And sometimes, home just wins. If you're feeling jaded about where you come from, being away will awaken you to all the ways that home is pretty darn great — whether it's small stuff, like knowing your peers will understand your South Park or Family Guy references, or big stuff, like not being afraid to express dissent. There's no quicker way to discomfort your host or kill a new friendship than to turn down the food they offer to share with you. Be brave! There will be bites you have to force down, but you'll be well compensated when you ignite a passion for French pastries, uncork a love affair with Chilean wine or uncover a yen for street-stand dumplings. Vegan? On a diet? Only eat organic? May we suggest taking some time off while abroad? Your stay will be less stressful, more fun. 6. Understand your major in a new way. Don't limit yourself to language courses! Whether you're studying history, mathematics, architecture or biology, you can gain a new perspective — and maybe even a great thesis idea — while away from your home campus. Sit in on specialized classes, attend lectures, join a club and introduce yourself to faculty. Better yet, get an internship in your field while abroad. You're going to meet some pretty incredible people — both locals and study abroad students from around the globe. You've got a limited amount of time, so don't be shy. Throw yourself into these new friendships and be rewarded with lifelong connections. Hands down, the best way to learn a language is to fall in love with a native speaker. What an incentive to improve your language skills! 8. Find out they're nothing like us. People in other countries don't just have a different word for every one of ours, to paraphrase Steve Martin. They really think differently than we do. The customer isn't always right. You don't have to form an orderly line. It isn't unfair to charge different people different prices. Soup is best at breakfast. It can be a little startling to have your assumptions tossed aside, but it's a good, if sometimes painful, learning experience. 9. Find out they're just like us. No matter how foreign a country may seem, you're bound to have a moment when you're struck by how people everywhere are generally more alike than different. At our core, we're all driven by the same needs and wants. You may even recognize a little bit of Grandma in the shopkeeper or a touch of Uncle Joe in the hostel owner. It's easy to play it safe while studying abroad — stick close to the program staff, check in with your parents daily by email, never venture far from your large suitcase full of belongings. But if you're the exploring type, this time abroad can be full of adventure. Hop on a train to a place no one you know has ever been. With little money, minimal language skills and no safety net, you're bound to get in a few scrapes — and discover your true mettle getting out of them. Whether you stay a month or a year, calm your "I can't do everything!" worries with the understanding that this is just a scouting trip for your next visit. You'll almost certainly be back someday to poke your head into your old haunts, discover what it's like to travel there when you're not a starving student and explore all the places you missed the first time. 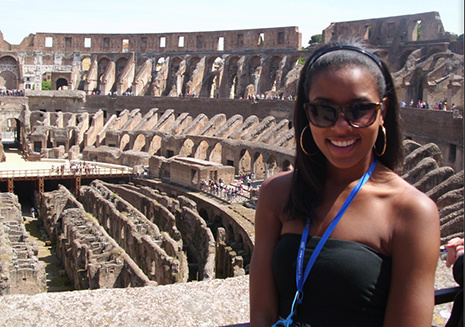 Studying abroad can be difficult but also tremendously rewarding. The only way to know what will be in your personal "top ten reasons to study abroad" is to take the plunge and do it! Don't take our word for it — read our student blogs!